Though technology has certainly had an impact in "leveling the playing field" between novices and experts in stock trading, there still exist a number of market inefficiencies for the savvy trader to exploit. Figuring that stock prices in the short term tend to some extent to reflect traders' emotional reactions to news articles published that day, we set out to create a machine learning application that could predict the general emotional response to the day's news and issue an informed buy, sell, or hold recommendation for each stock based on that information. 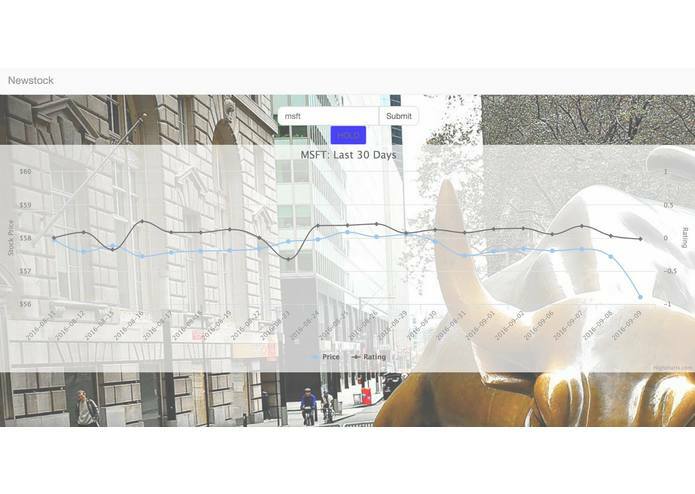 After entering the ticker symbol of a stock, our application allows the user to easily compare the actual stock price over a period of time against our algorithm's emotional reaction. We built our web application using the Flask python framework and front-end using React and Bootstrap. To scrape news articles in order to analyze trends, we utilized the google-news API. This allowed us to search for articles pertaining to certain companies, such as Google and Disney. Afterwards, we performed ML and sentiment analysis through the textblob Python API. We had some difficulty finding news articles; it was quite a challenge to find a free and accessible API that allowed us to gather our data. In fact, we stumbled upon one API that, without our knowledge, redirected us to a different web page the moment we attempted any sort of data extraction. Additionally, we had some problems trying to optimize our ML algorithm in order to produce as accurate results as possible. We are proud of the fact that Newsstock is up and running and able to predict certain trends in the stock market with some accuracy. It was cool not only to see how certain companies fared in the stock market, but also to see how positivity or negativity in media influenced how people bought or sold certain stocks. First and foremost, we learned how difficult it could be at times to scrape news articles, especially while avoiding any sort of payment or fee. Additionally, we learned that machine learning can be fairly inaccurate. Overall, we had a great experience learning new frameworks and technologies as we built Newsstock. I worked on the front-end and its connection to the back-end.